“Satiana’s Magical Adventure” from Christian Faith Publishing author AEA Kimlin is a charming fantasy novel following Satiana, a twelve-year-old girl found abandoned in the forest as a baby, rescued by the sorceress Kamori, and brought to the Orchid Village to be raised as an enchantress; however, Satiana is having trouble controlling her powers, and when she finally harnesses her powers to win a tournament, a white-skinned demon confronts her, calling her “Moon Child,” inevitably sending Satiana on a quest to find her long-lost parents, the Moon People, and ultimately defeat the Lord of Darkness. “Satiana’s Magical Adventure”: a captivating coming-of-age fantasy saga featuring a twelve-year-old enchantress. “Satiana’s Magical Adventure” is the creation of published author AEA Kimlin, nicknamed “Ali,” a free-spirited young woman of creativity who has dabbled in fashion, writing, drawing, anime, and music. She is currently attending college in Texas. Kimlin envisions a day in the life of a young sorceress: “At the classroom, the teacher is teaching the students on how to control their powers and how attacks and magic work. Some of the students are paying attention carefully while some are bored and are not interested in listening to some boring teaching. Some who are already capable of using and controlling their powers either read a book, play around with his or her powers, or fall asleep during class. Satiana is taking notes diligently, Kiki is reading a book, and Marisa is bored out of her mind. Published by Christian Faith Publishing, AEA Kimlin’s new book is an imaginative exercise in creativity recounting the lives of “ordinary” girls who happen to have magic powers. AEA Kimlin weaves a quick, beguiling narrative full of magical duels, demons, friends, and the everyday worries of a young girl just trying to survive long enough to find out who she is. View a synopsis of “Satiana’s Magical Adventure” on YouTube. 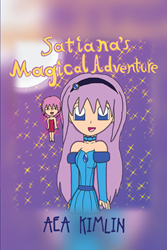 Consumers can purchase “Satiana’s Magical Adventure” at traditional brick & mortar bookstores, or online at Amazon.com, Apple iTunes store, or Barnes and Noble. For additional information or inquiries about “Satiana’s Magical Adventure”, contact the Christian Faith Publishing media department at 866-554-0919.